The Church was born out of the obedience of God’s people to the Great Commission given by the Lord Jesus (Matthew 28:18; Acts 1:8). The apostles obeyed His command and as a result, the Church came into existence. The Church fathers would then follow the example of the apostles by sending out missionaries and starting churches in the unreached communities by doing God’s work interculturally, near culturally and cross culturally (Acts 13:1-2). Thus, in A.D. 52, one of the apostles of Christ, Thomas, came to India to preach the Gospel. He baptized those who believed and established seven churches in the state of Kerala. He then appointed ministers to continue the work he had started. Later, he traveled to the neighbouring state of Madras and was martyred for his faith. From that small beginning, we now have 2,000 years of Church history in the Indian sub-continent. Just as in the early church in the book of Acts, spreading the Gospel resulted in churches being started. Similarly, GFA World, an international evangelical mission, is committed to seeing the Great Commission carried out in the 10/40 Window. By God’s grace, the book of Acts is being repeated in these unreached regions. Through the faithful service of GFA missionaries, churches were established. As these churches began to multiply, the elders of GFA’s ministry on the field decided to establish them under the name of Believers Eastern Church, based on Acts 2, where believers came together to worship the Lord. It is exciting to see new believers in these fellowships growing in the knowledge of God through the systematic study of His Word, and learning to be disciples of our Lord—just like the early Christians did. In the early stages of Believers Eastern Church, the leaders met several times to decide on the faith and order of the church. Once again, they sought the Lord through His Word to find out the biblical description of the early Church, as explained in the book of Acts. They did this to avoid the mistakes and pitfalls that have been repeated over and over by so many church-planting movements throughout history. As a result, we discovered that for any movement to continue in the evangelical faith, with godliness and stability, there must be: (1) a strong emphasis on God’s Word (a systematic verse-by-verse teaching of the Word with practical application); (2) a church governance that helps maintain order, discipline, unity and accountability; (3) godly traditions of faith (sacraments) regularly practiced; (4) an all-out commitment to fulfilling the Great Commission. Today, Believers Eastern Church, with over 2.6 million members scattered throughout Asia, is another proof that what Jesus said is true: “I will build my church; and the gates of hell shall not prevail against it” (Matthew 16:18). Believers Eastern Church was born out of missions and continues to follow in the footsteps of the apostles in faith and practice. We are part of God’s Body, His Bride, His Church. All of the glory and honour and praise for Believers Eastern Church go to Him and not to us. We are humbly grateful to God to be part of the holy, universal, apostolic Church, and we are deeply committed to fulfilling God’s call, which is to know Christ and to make Him known. The mission of our church is to glorify God—the Father, the Son and the Holy Spirit—by following in the footsteps of the ancient orthodox faith and practice of the holy church to worship God as He desires, to grow together in love and unity, to instruct and equip the body for the work of the ministry and to fulfill the great commission of the Lord Jesus by all means through word and deed. Supremacy of Jesus Christ – The most important thing in the whole world is to know Jesus Christ intimately and to become like Him in every way. He is central in our worship and personal lives, and literally, all things in His creation are centred around Him. Keeping Christ as the centre and the focus of Believers Eastern Church will naturally produce good and lasting fruit for His glory and for the furtherance of His eternal Gospel. Empowered by the Holy Spirit – It is the Holy Spirit Who gave birth to the Church and Who empowered the disciples in the book of Acts to open the eyes of the blind, heal the sick, raise the dead and preach the Good News to the poor. God, the Holy Spirit, is still empowering men and women like this today, and Believers Eastern Church depends upon His power to build Christ’s Church in the neediest nations of the world. The Priority of the Word – Believers Eastern Church gives priority to the reading, study and systematic teaching of God’s Word. Our desire and longing as a church is to be like the Bereans of Acts 17 who received God’s Word with all readiness and searched the Scriptures daily to find out if the teachings given them were true. God’s Word is the foundation of faith (Romans 10:17) and is the change agent that brings Christ’s followers to full maturity. Growing in Love and Grace – Jesus said, “By this all will know that you are My disciples, if you have love one for another” (John 13:35). For this reason, a major emphasis and core value of Believers Eastern Church is being a people of love and grace. Our evangelical, orthodox faith; sound doctrine; and gifts from the Holy Spirit are absolutely worthless if love and grace are not displayed practically and in everyday life. Commitment to Prayer – Another guiding principle of Believers Eastern Church is our serious commitment to prayer. Believers Eastern Church was started through prayer, is sustained by prayer and will die without prayer. Dependence upon human methods to build God’s Church is a sad fulfillment of our Lord’s words through His prophet Jeremiah, “Cursed is the man who trusts in man and make flesh his strength, whose heart departs from the LORD” (Jeremiah 17:5). Passion for Souls – Sharing the love of Christ always and in every way is a major priority of Believers Eastern Church—in the same way that it was at the heart of the New Testament Church. Like the early church of Acts 2, we have at our core the non-negotiable commitment to fulfill the great command of Jesus Christ from Matthew 28 and Acts 1. Ministers of the Church – We believe in the priesthood of all believers (Revelation 1:6). At the same time, a major emphasis of Believers Eastern Church is on the character of our pastors, missionaries and leaders. The work of God suffers today not because of a lack of money or education, but for the lack of authentic, God-fearing leaders in the Body of Christ. God, not men or organizations, calls people into the ministry. And His calling involves a deep sense of ownership, conviction, pain, suffering and faithfulness to Him. Believers Eastern Church focuses greatly on the Christ-like character of the pastors and leaders, knowing that they will only reproduce what they truly are in their inner life. Church Government – Believers Eastern Church is established in accordance with the biblical New Testament foundation for church governance as laid out in Acts 14 and 1 Timothy 3. God is the Head of Christ, and Christ is the Head of His Body, the Church. Under Christ, the Head, there are episkopos and presbuteros (bishops and elders) who give servant leadership to the Church. A more complete description about Believers Eastern Church government is offered in the "Practical Distinctives" section. The Blessed Hope of the Church – Like the early Church, Believers Eastern Church believes in the literal snatching away, or rapture, of the Church spoken of in 1 Thessalonians 4:17. After the rapture, Believers Eastern Church believes in a seven-year period of tribulation that will come upon the whole earth, while the raptured Church, Christ’s Bride, takes part in the Marriage Supper of the Lamb (Revelation 19:9). This is the blessed hope of the Church! Soon we are going home to heaven to be with the Lord Jesus Christ, to look upon His face and to be with Him forever. In light of this truth, we should live in a constant state of holiness and purity, eagerly persuading others and eagerly waiting for our Lord. Today there are over 33,000 denominations worldwide, each with different practices, teachings and traditions. Yet as we individually adhere to the non-negotiable doctrines of Scripture, we remain united in the body of Christ. In the same way, a branch is considered part of the tree as long as it is still connected to the root. Paul instructs us in 1 Timothy 4:16 to guard both the purity of doctrine as well as our character. We consider Believers Eastern Church to be rooted in the Word of God and part of what the Lord is doing, especially among the most unreached, in our generation. It is good to keep in mind the command Jesus gave us to obey, and the evidence that we belong to Christ is love (see John 13:34-35). We, as a church, adhere to the Spirit-filled, orthodox faith of the Church, which has not changed for 2,000 years. We believe in all the fundamental doctrines of ancient Biblical Christianity. We accept and confess the historic Creed of Nicaea, Constantinople and Ephesus. We believe and practice the holy sacraments followed by the historical church. We believe in the person and work of the Holy Spirit, who indwells, seals and empowers all believers, baptising them into the Body of Christ. In order for any society or nation to function properly there must be rules, guidelines and disciplines established, along with quality leadership to implement and exemplify these practices. The same is true of the Church. When there is no governance, discipline, organization or systems, eventually things will degenerate into anarchy and chaos (Judges 21:25). From the Scriptures, we can clearly see that the only form of government God ever endorsed and established was theocracy—a government under the immediate direction and administration of God Himself. Although God ultimately ruled, He made Moses the first human leader of His people. Whenever a decision needed to be made, Moses asked God and He spoke to him, giving him direction to lead the people. However, Moses was not alone—he had many elders to assist him (Exodus 18:13-27; Numbers 11:16-30). In the New Testament, we see a revised form of God’s established government for the Church. The chain of authority begins with God as the Head of Christ, and Christ as the Head of His Body, the Church. Under Christ, the Head, there are episkopos (ἐπίσκοπος) and presbuteros (πρεσβύτερος) (bishops and elders) who give servant leadership to the Church (Acts 14:23; 1 Timothy 3:2). Believers Eastern Church is established in accordance with this biblical foundation for church governance. With this foundation in mind, there were some very practical reasons Believers Eastern Church needed to be established the way it is. Abiding by constitutional ordinances is one of those reasons. The constitutions of many of the south Asian nations where GFA serves were written after their independence from England. Because of this, the governments retained the English definition and criteria for certain legal functions of a church. This criteria has nothing to do with doctrines but is an assurance to the governments that the church has a responsible governance and proper accountability. A church established according to the constitutional standard receives certain governmental protection and rights. So, in keeping with the biblical foundation for church governance as well as abiding by constitutional criteria, Believers Eastern Church has an episkopos church structure, including a council of episkopos, local ministers, and a metropolitan who gives guidance to the ministry. This type of church structure and leadership is common among evangelical churches in Asia and has served to strengthen biblical discipleship, accountability and succession into the future. Another advantage of following this structure is that all properties, church buildings and institutions of the church cannot be sold or exchanged by an individual, ensuring a very high level of financial integrity. The constitutional church structure simply does not allow for any one person to own any of the assets of Believers Eastern Church. Instead, all property belongs to the church. The rights gained simply by having a structure that meets the criteria of the country’s constitutions enable us to do more ministry, outreach and evangelism than ever before—and it is all under the protection of the church. There are also several other legal laws in many of the nations where Believers Eastern Church operates, which could adversely affect the work if they were not followed. For example, the Indian Christian Marriage Act of 1872 requires that a minister must be licensed by the Government Magistrate or the minister be ordained and licensed by a bishop from a church that meets the constitutional criteria in order to legally conduct a wedding. Specifically, the bishop must come from a church with the “Constitutional Episcopacy” style of government. One can imagine the dilemma we would have in trying to perform marriages among millions of believers if none of our 12,000 pastors were licensed by the government authorities! If you ever travel to various Believers Eastern Church ministry sites, you may encounter practices, protocols and dress codes that are a little different from what you are accustomed to. Some of them are simply cultural, others are biblical practices that may not be emphasized as much in other nations, while others are just matters of practicality. It is important to note that many evangelical churches in Asia share the same or similar church systems and practices as Believers Eastern Church. This practice has proven to be very useful over and over again. It allows our pastors to deal with the government officials and others in authority during times of intense persecution, where previously they were often not even acknowledged. Their uniform gives them a lot of credibility and respect throughout the nations where we work. One great challenge has always been the number of first-generation believers. Right now, there are over 2.6 million of them in our churches, representing 324 languages in over a dozen nations. There is a lot of room for false teaching, disorder and confusion to seep in. We make use of liturgy in some parts of our worship service in order to strengthen the unity and establish these new believers in faith. Liturgy simply means a systematic order of worship. Believers Eastern Church liturgy includes prayers, Scripture readings and a confession of the Nicene or Apostle’s Creed of the Church. These serve to bind us all together in common faith. For example, by following the Lectionary (systematic reading of the Word of God), within three years, a very large portion of the Bible is read out loud during the worship service. This is especially important when we realize that among the Dalits, 90 percent of the women are illiterate. This way, they hear the Word read out loud to them. In our worship service, there are 30 minutes of worship and 40 minutes of systematic teaching from the Word of God with practical applications. All of this is not to the exclusion of spontaneous prayer and worship, which we also enthusiastically encourage and teach. In our church services, you will see that the women wear head coverings as is mentioned in 1 Corinthians 11:2-16. In the same way, we adhere to the practice of baptism as commanded in Matthew 28:19, and Holy Communion, which is given to us in 1 Corinthians 11:23-26. These are all part of the traditions of faith of Believers Eastern Church. Along with many Eastern evangelical churches in Asia, the members of Believers Eastern Church use the Christian sign of the cross to help identify them as followers of Christ as opposed to followers of other faiths. It is also a powerful visible symbol which says, “The Lord Jesus came from heaven to earth; died on the cross for me, a sinner, to take me from the left, representing the kingdom of darkness, and place me on His right side, representing salvation” (see Matthew 25:31-46). You may notice that sometimes, when someone meets a senior leader or a bishop, they often lean forward slightly as a sign of respect, and for him to touch them on their forehead or shoulder and bless them. This is a common tradition in the Eastern Church, where respect of those who are older and in spiritual positions is taken very seriously. Our ministers are called by many titles, including pastor, vicar, brother, bishop, episkopos and metropolitan. This in no way means we are Catholic in our faith or in practice, but rather, these are common terms for leaders, as understood within the context of church. No matter what title we use, no man should take the place of God and His authority in our lives. We want to remain an organism—living and active—being and doing the will of the Head of the Church, the Lord Jesus Christ. The emblem of Believers Eastern Church is a continual reminder of this objective. The early Church fathers chose the symbol of the cross as a reminder of all that Christ had done for them. Its two bars were already a cosmic symbol from remote antiquity, representing the axis between heaven and earth. Their choice had a specific explanation. They wished to commemorate as central to their understanding of Jesus, neither His birth nor His youth, neither His teaching nor His service, neither His resurrection nor His reign, nor the gift of the Spirit, but rather His crucifixion and His death. 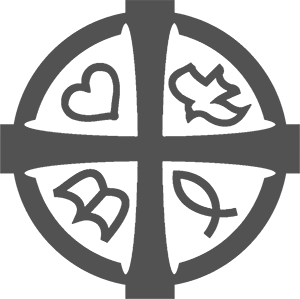 The four emblems within the circle stand for the emphases we have in Believers Eastern Church. The book represents the Word of God.17 We believe the Bible is the only and absolute authority for our faith and conduct. No tradition, no matter how good it may be, should ever violate the Word of God. The sole authority for the faith and practice of the church is the Bible and nothing else. The dove symbolizes the Holy Spirit.19 We give biblical emphasis to the working of the Holy Spirit as is described in the New Testament. Without the power of the Holy Spirit, no one can live a victorious Christian life; hence, we give biblical emphasis on the baptism of the Holy Spirit, gifts of the Holy Spirit and fruit of the Holy Spirit in a Christian’s life. During the severe persecution of the early Church, Christians used the noncommittal painting of a fish to identify and greet one another, only known by the believers themselves. The ichthys (“fish”) was an acronym for Iesus Christos Theou Huios Soter (Jesus Christ, Son of God, Savior). But it did not remain the Christian sign because the association between Jesus and the fish was purely acronymic and has no visual significance. 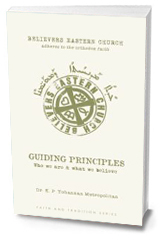 Thus, the unique character of Believers Eastern Church is expressed in the design of the logo—a people deeply committed to the faith and practice as revealed in the Word. 1 Corinthians 12:13; 2 Corinthians 1:22; Ephesians 1:13; Matthew 28:16–20; Acts 1:8. Galatians 2:20, 6:14; Colossians 1:15–20; Ephesians 2:11–16. Galatians 2:20, 6:14; 1 Peter 2:21. Isaiah 40:8, 55:10–11; Matthew 7:24–25; John 20:31; Acts 2:42, 6:4; Galatians 1:8–12; 2 Timothy 3:15–17, 4:2; Hebrews 4:12; Revelation 22:18–19. Matthew 3:11; Luke 11:13, 12:12; John 4:24, 7:38–39, 15:26; Acts 1:8, 2, 4:8, 4:31, 8:15, 11:15–16, 13:2–4, 13:9, 13:52, 16:6–7, 19:2–5; Romans 8:1–27; 1 Corinthians 12; Ephesians 5:9; 1 Thessalonians 5:19. John 13:14–17, 13:31–35, 15:12–13; Romans 13:8; 1 Corinthians 1:8; 1 Corinthians 13; Galatians 5:13–26; Ephesians 5:2; Philippians 1:9; 1 Timothy 1:5; 1 Peter 1:22; 1 John 2:10, 3:11–23, 4:7–21. Matthew 28:19; John 4:35–38, 15:27, 20:23; Acts 1:21, 10:42, 16:4, 18:9–10, 20:28; Romans 10:13–15, 12:6–8; 1 Corinthians 9:16–17; 2 Corinthians 4:1–5, 5:14–17, 6:3–10; Ephesians 4:11, 6:20; 2 Timothy 4:1–5.